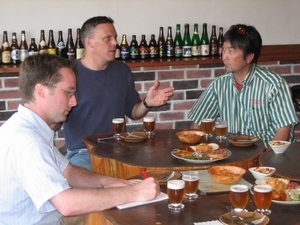 The development of craft beer in Japan is an exciting story, two parts of which I document in the newest issue of BeerAdvocate Magazine (the article apparently inspired the crazy comic book, fan boy cover). The new column profiles Toshi Ishii, COO and brewery director for the Yo-Ho Brewing Company in Karuizawa near Nagano, and Bryan Baird, founder with his wife Sayuri, of the Baird Brewing Company in the small coastal town of Numazu, an hour south of Tokyo. I recently received an email from Toshi (who spent his formative brewing years as the Stone Brewing Company’s third employee), who is one of the great breed of traveling brewers. Although he is the head of brewing for a fast growing craft brewery in Japan, Toshi spends nearly half of his time out of the country visiting other breweries around the world. According to Toshi, he’ll be in the United Kingdom three times this year and the United States another three times. Toshi’s first trip to the United Kingdom, which is presently under way, is what caught my eye yesterday. Toshi learned of cask-conditioned beer, often called real ale, at one of Pizza Port’s earliest beer festivals. After his first sip, Toshi stared down at his glass in amazement and had to ask friends what he was drinking. Fast forward a decade and Toshi is single-handedly leading a cask ale revolution in Japan. He helps run a sizable cask ale festival in Japan and sells his popular Yona Yona Pale Ale on cask at hundreds of locations across the country. When I met him in May, Toshi told me about his trips to the Great British Beer Festival, where he has served his beers a few times. He clearly loves the event and the opportunity to travel the country that is home to so much cask ale. Toshi’s trips to England aren’t just for fun. Instead, Toshi is happily ensconced at Marston’s Burton upon Trent brewing beer. Toshi was recruited by the JDWetherspoon Group last summer at the 30th GBBF to come to England to brew his Tokyo Black beer. The very drinkable porter is a hit in Japan, where it is very distinguishable from nearly every other ji-biru¬. Toshi is scheduled to make 40 kl of the beer, which will be placed into 1300 casks for sale at 650 pubs in the United Kingdom. The beer will be released at JDWetherspoon’s International Real Ale Festival, which will be held March 27 to April 14, 2008. Of course, Toshi will be back in late summer for the next GBBF.